A dazzling performance from Alexis Sanchez with not one but two neat goals, plus Laurent Koscielny's thumping header from eight-yards secured Arsenal all three points at The Emirates. The sun glared down on the stunning Emirates, with a terrific match in prospect. A few gaps in the stadium, however a raucous atmosphere ringing from those in attendance made up for that. The Gunners broke early, looking to draw first blood against a tricky Stoke side who are defensively sound. Sanchez scorched down the left, angled himself for a right footed curler. He unleashed but Begovic comfortably saved, where a few moments later the Stoke keeper thwarted a drilled Rosisky strike to tip it around the near post. Arsenal's positive start, with attacking movement proved to be decisive just six minutes in. Sanchez, arguably The Gunners' best player in the season thus far, dribbled down the left channel and was easily allowed to whip a delivery in which found unmarked, and loitering Koscielny. The French centre back would lash a powerful header straight past Begovic from eight-yards out. Terrific start from Wenger's men, who looked superb up front in the early stages. However, the Arsenal manager's hand was forced just eleven minutes into proceedings. Debuchy tries to prevent the ball skittling out of play but was unfortunately, and unnecessarily barged in the back by Arnautovic which called for medics to take the Frenchman off the field on a stretcher. Begovic, one of the most underrated goalkeepers in the Premier League, did fantastically well to keep out another Arsenal attacking move. Sanchez caused bother down the left yet again, until The Chilean diverted the ball through to Giroud central but his powerful shot was palmed away by the Stoke man. Stoke had little to show for attacking wise, with Arsenal combating any spurge of movement Hughes' men offered. However, just over twenty-five minutes in they won a free kick on the right which was banged in by Pieters, shielded down by Bojan to the completely unmarked Whelan but his shot skied over the crossbar. Best chance of the game for Stoke. Seemingly game over for the visitors thirty-three minutes in. Lightening quick Sanchez robbed Nzonzi in the centre and exchanged attacking passes with Rosisky until the ball fell back to Wenger's star man, where The Chilean dazzled into the area and unleashed a beastly curler into the bottom hand corner straight past a bewildered Begovic. Stoke soon countered up the field, which saw Cameron go beyond the Arsenal back line and dash a sweet low cross initially directed to Walters but Mertesacker took no prisoners and got a leg to it. Short, but worthy momentum fell to the visitors just before half time, as Crouch impressively robbed Koscielny in the centre and galloped his long legs through to the edge of the box, but with no overlappers or support nearby the Englishman vaguely let loose his shot which comfortably fell into Ospina's grasp. The half time whistle sounded as Arsenal lead Stoke by two goals. Koscielny's terrific header from eight yards plus the dazzling work of Sanchez enabled Wenger's men concluded first half proceedings with confidence and authority over a bestirred visiting side. Only four minutes into the second half, the marvellous Sanchez struck a third goal for Arsenal. The initial free-kick he hit was seemingly a mishit but nevertheless, it sneaked through the Stoke wall at close range and fumbled past an agonized Begovic, almost kissing the left hand post. Really poor performance from Stoke, it seemed as though every single player wanted nothing to do with the goal after Sanchez's third. Not blamable, however their attitude let them down. However. Hughes's men would come extremely close to pulling a goal back. Mertesacker's vague pass to Oxlade-Chamberlain was scooped up by a charging Muniesa whom proceeded to the edge of the box, stabbed a low cross to Crouch but his effort fell lamely wide of Ospina's stick. Sanchez didn't think twice about giving the visitors a break from his mesmerizing dribbling runs. Stoke felt the wrath as Chilean's sensation dazzled through the middle and cut back to Giroud on the left, however the striker's effort deflected wide. Superb play from Sanchez, though. No traction for Stoke attacking wise at all. Bojan tried changing that with a neat run inside the box, and his lay-off to Walters looked promsiign until he stupidly wasted an opportunity to shoot on his left and switched to the right boot where the strike blootered over. Mesut Ozil returned from injury to replace Giroud, where The German made an immediate impact. Superb piece of play as he impressively linked passes with Sanchez until scooping the ball over his shoulder to Monreal on the left. The cross was cleared, however great play by the hosts who racked up a big round of applause. The full time whistle sounded; to a vibrant cheer and applause from the Arsenal fans who had witnessed a mesmerizing performance by Sanchez up front. Their defence was mostly solid too, which is a huge positive for The Gunners. Fantastic performance from Arsenal, especially Alexis Sanchez who is really proving to be an unstopapble force against any opposition. Stoke, however, are glad it's all over. Poor display from Hughes' men, perhaps down to the relentless pressure of Sanchez. 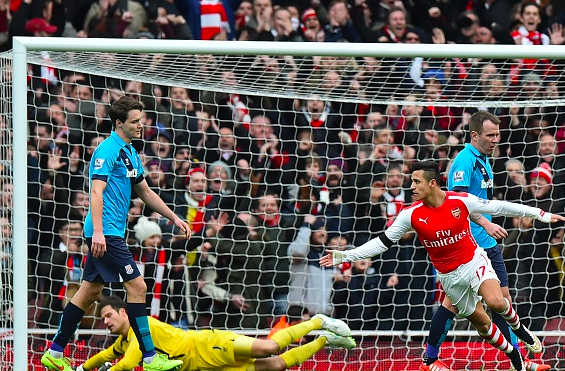 Alexis Sanchez torches a bewildered Stoke City as Arsenal run riot at the Emirates.